Ask Cinko Event Flyer Small, a photo by www.bazpics.com on Flickr. 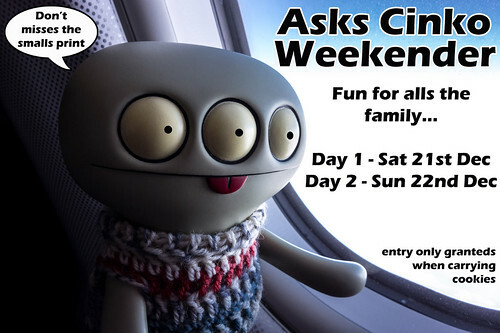 It's almost time to kick off the Ask Cinko Weekender event, but before it all begins, here's the info on what it's all about and how you can get involved, from Cinko himself (as he obviously made up the rules). Whats is the Asks Cinko Weekender? The Asks Cinko Weekender is a two days eventer which allows you, my buddies outs there in internets land to askers me questions on stuffs and I will gives you my answers. What can you askers me? Anythings, really, anythings at all, you can askers me abouts life in the cookie cave, abouts my year travellerings with Baz, the meanings of life, whats type of cookies is the bestest, you gets it, anythings at all. When does the events kicker off and finishes? How can I gets involvereds? To makes life easiers for everyone, the basecamper will be rights on Baz's Flickr accounter, and he has promisereds me that his normals uploaderings will be stoppereds for the weekender too! Don't worries if you doesn't has a Flickr accounter, I will explains more in a seconder. You can replies directly to my photomagraph on Flickr for days 1 and days 2 with your questions and I will then gives you my answers, how simplers is that! For anyones out there in internets land that doesn't has a Flickrs accounter, don't worries, as I is a technomalogicals whizzkidder you can also reachers me on Facebookers, Googlers Plus, Twitters and Bloggers, talks about a lots of ways to contacts your gooders buddy Cinko! Does we needs to pay for this services? Of course nots, I is a non profits makering types of guy, there's no needers to brings money, buts cookies will always be gladlys acceptereds!